Shop PRS Paul Reed Smith Archon 50 Guitar Amplifier Head with 6L6 from AMS with 0% Interest Payment Plans and Free Shipping. Based on the ARCHON 100, and using two 6L6 Power Tubes, the PRS Paul Reed Smith Archon 50 Guitar Amplifier Head is still the same fire breathing monster as the 100 but with a little more give in the power amp for more of a vintage feel. This is especially true on the clean side. By revving up the clean master volume and using the channel volume for decibel/level control one is able to get nearly a Plexi overdrive out of this beast. Drop it down to 25 watts, and look out, this thing is magical. Overall a killer sounding amp with modern high gain flavoring and vintage undertones. We've also got a killer brushed aluminum face plate that gives the amp an industrial/modern vibe and also visually separates it from the 100 Watt. I bought the amp looking for a head that could cover blues and heavey metal. It does all I was looking for plus. This is a well designed, beautiful sounding amp. Plenty of power for any situation and when paired with a PRS 2x12 is super beefy. Don't let the simple controls mislead you, there is plenty of headroom for gain from low crunch to searing hi gain. The Presence and Depth knobs, though global controls, really help to shape your distortion sound while still being able to compensate on the clean channel, or vic versa. Highly recommended amp. Thanks to AMS for offering the best payment plans in the business and for the fast shipping! This amp really does deliver for a high gain amp. I own several high gain amps which include a Bogner Uberschall, ENGL Savage, EVH 5153, Peavey 6505 and more. This amp is my favorite out of the bunch. Killer modern crunch tone. The clean channel on this amp is outstanding as well. It's just an all around great amp. It's easy to dial in right out of the box. It's also great having the option to run this amp at either 50 watts or 25 watts. Saves money from having to install a variac. I'm honestly confused on how this amp isn't more popular and being used by more guitarists? I understand how some guitarists may not favor the pricing on this amp, but it's American made and hand wired. You usually pay more than this for this type of quality & built with other brands. I will advise this amp IS NOT a three channel amp. It does not have built in Reverb either. These particular things do not bother me, but it's good to mention for those of you looking for these options on a higher gain amp. Bought this at a discount because it was a return (minor blemish). True to what AMS promised it was in pristine condition. I could not find a flaw, Plugged my Parker Fly in and I was stunned by the sound I was creating. I can't wait to gig with this Amp in the fall. Heads are going to roll! American made to boot. What;s not to love??? Got this delivered today and the YouTube videos (that already make it sound awesome) don't do it justice. The cleans are amazing. Everybody says it and it's true. There is a ridiculous amount of gain available and you'd be hard pressed to find an application where you had to Dime it. It's nice and punchy without being super dry and compressed. I'm currently fiddling with The switchable 25 watt mode and it absolutely slays. Its got so many features it can be used for any genre of music. Buy this amp! This amp is freakin bad a$$! I had checked out a number of videos demoing the amp and decided to pull the trigger...this outperforms my Carvin V3 in all facets...more gain than one can ever need and an excellent clean tone, something one rarely EVER sees in a metal oriented amp...I could easily play jazz or country on this amp as well as rock and extreme metal and it's only two channels. 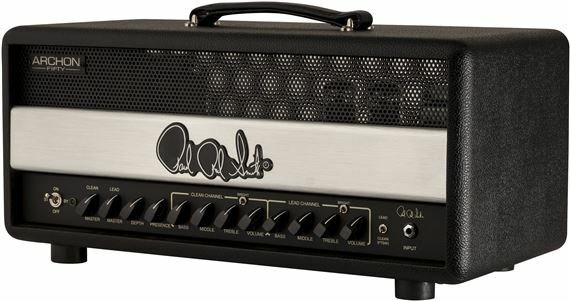 The EQ is well voiced and the amp sounds amazing set flat...my own settings aren't far from that right now. THe Archon takes pedals really well and it brings out the tone/voice/character of each guitar I have much better than previous amps I have had (I have various superstrats with various active and passive pickups, a strat, and a couple PRS SEs, a custom 24 and singlecut). I had initially planned on saving up for a different amp (H&K Grand Meister) but this thing blew me away...I may still get the Grand Meister down the line but this Archon is here to stay.